The Fast Track circuit in Taguig shall hosting its first ever off road moto school on January 6, 2008 ( Sunday ) . The school shall be hosted by Japanese Veteran Instructor Ken Tabuchi a certified and current instructor from Japan and races with Yamaha Motor Co. The school shall start at 9 am to 5pm and the track shall be closed on this Sunday for the school purposes. Riders are advised to come in complete riding gear and morning session shall be of the seminar type in the Fast Track Clubhouse Suite # 1 lunch will be served and practical riding in the afternoon and registration fee is at PHP 2,000, for more info you may reach Arthur Valdez 0917.847.9785 there shall be limited slots available and few are left so hurry and book now! 17yo Aussie breaks Theplib’s winning streak but Thais sweep all before them in both the 125 & Jr 85 FIM UAM Asian Motocross/Supercross Championships. 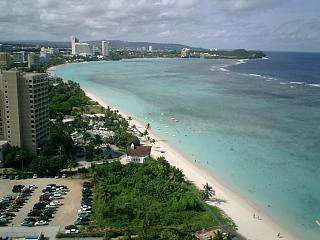 The Asian Continental Union’s newest member, Guam, hosted the final AMSC Round for 2007 as a night event at the Jose & Herminia Calvo Memorial Off-Road Park. With naming rights to Shell V-Power and support from an array of local businesses including Cycles Plus, Outrigger Resort and Pine Rental, the Guam Federation GMAC organised a variety of entertainment including Drifting, 4/4 car crushers, and BAM Miller Lite Street Bike Show to keep spectators happy until the main event under lights. Unfortunately China and Mongolia were absent due to late visa issue, especially heartbreaking for Mongolia who tried everything after eventual Friday 4.00pm issue however even with revised Airline schedules they would only have been in time for the post event beach side barbecue. Both the Australian and Indonesian contingent arrived on the Friday morning and proceeded straight to the Outrigger Hotel Press conference after their overnight flights. Especially rushed for Aussie Matt Ryan as he was substitute for fellow Yamaha Rider Ford Dale who unfortunately broke his wrist while they were both attending a specialised MA/AIS training course just days before departure. GMAC PR officer Bob Bucek gave the assembled media an outline of the FIM UAM Championship with all participants introducing themselves in their own language. Ruben Domingo of Shell Guam gave the closing address then it was off to the track for the Riders 1st practice session, but alas the rain soaked track was barely usable. Ryan’s allocated bike expired on his first lap and when he was offered a brand new YZ 125 – the only twostroke in the event, the happy go lucky kid laughed and said it will be fun to ride. Saturday race day and track condition better but still muddy and slippery. Thirteen Riders on the line as the gates dropped for the downhill start straight to the left right chicane. First lap positions - Turbo in the lead followed by Hong Kong licenced Sean Hewitt then James Robinson-New Zealand and then Matt Ryan. By lap 2 both Robinson and Ryan had passed Hewitt with the main pack behind. Meanwhile Guam’s Brian Gumataotao and Stan Yasuhiro were out on the first lap and Sean Hewitt retired on lap 5 after a big off on the far side of the circuit. Positions of the front 3 of Turbo, Robinson and Ryan remained constant as they encountered lapped Riders on the 7th lap and then the Aussie passed the Kiwi on the 10th lap and that’s how positions remained for the rest of the 20 min + 2 lap race with Turbo holding a comfortable 13 sec lead over Matt’s Two Stroke toward the end of the 23 lap race. Moto 1 positions – 1st Turbo, 2nd Ryan. 3rd Robinson. 4th Shane Morrison Guam. 5th Kenneth San Andres Philippines. 6th Takeshi Tabuchi Japan. 7th Denny Orlando Indonesia. 8th Karam Gautam India. After Moto 1, the heavens opened up and the circuit resembled a lake with Islands ! With credit to drainage design by track builders Bryan Pine and Greg Perez, the bulk of the water did run off, however the track had been severely soaked and all that could be done was delay proceedings. There was even some talk by the faint hearted to cancel Moto 2 but at 9.55PM, with only 9 Riders on the line the second Race commenced and once again it was Turbo in the lead with his CRF250 Honda on lap 1 but followed this time by Ryan, then Robinson KTM to San Andres Kawasaki, Takeshi Tabuchi Yamaha, Shane Morrison Kawasaki, Denny Orlando Kawasaki. Riders were falling everywhere as they battled the elements of the Yigo circuit and endeavoured to just stay on their mud caked machines. Ryan’s turn to fall on the 5th lap and it was lap8 before he regained his position in front of the Kiwi and from there he had the two stroke positively screaming as he started to close on Turbo way out in front and on the 12 lap he did it and was able to hold the lead to the chequered flag. Only Matt and Turbo completed 18 laps and in fact only 4 Riders officially completed the race. Positions 1st Matt Ryan Australia. 2nd Arnon Theplib Thailand. 3rd James Robinson New Zealand (17laps). 4th Denny Orlando (15laps) Back in the paddock after the race there was many a hard luck story with the main theme being not so much falling, but being able to lift the mud caked heavy machines and restart in the atrocious conditions. Pacific Motors Yamaha Owner Sati. 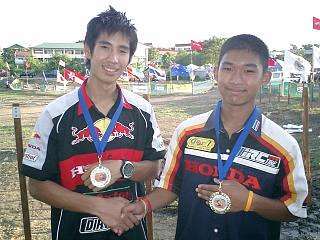 After the Guam race presentations, it was on with the announcing of results of the two Categories of the prestigious 2007 FIM UAM Asian Motocross/Supercross Championship in which Thailand was the winner of all awards. The 85cc Guam Event was declared non UAM Championship as it contravened Regulations of minimum10 eligible 12 – under 15yo Riders on the line for Moto 1 therefore Championship positions were declared as of the previous Manila Round, unfortunate for Errol Angoco of Guam who actually won the first Moto after a malfunction with Thailand’s Arongkot Pinpon’s bike.